During the Bunsei era (1818-30) the Eisen style of bijinga became popular, displacing that of Kikukawa Eizan. Although he was a landscape artist similar to Hiroshige, his style of portraying beauty was dramatic and gives a feeling of decadence, differing from previous artists. Eisen incorporated beauties and landscape into his series of the Bijin Tōkaidō which consists of 40 images. In each image, a beauty stands in the foreground while, with a Genji-kumo (Genji-style cloud) as a partition, a scene of a landscape is depicted in the background. 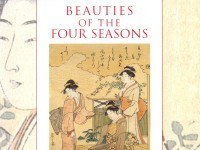 In an earlier version of this series, published in the end of Tenpo era (1831-40), there are poems inscribed on each of the scenes. This print show a beauty putting on her padded blue kimono at the 36th station of the Tōkaidō, the Akasaka-yado. 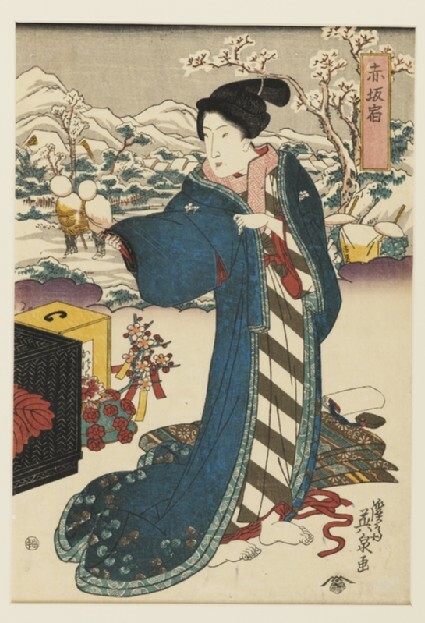 The combination of the lady with various kimono accessories including a box containing wigs on the ground, and people wearing straw hats in the snow in the background, suggests winter or ealy spring.